It was about embedding in her truth. These few minutes of time, freely given and devoted to my daughter, are the kinds of moments that often slip right by if we don’t seize them…and fight for them. As my daughter “beautified” me with the best routine she could think of….makeup, hair, and the works, I reminded her that she is utterly and unconditionally loved. Completely lavished with love is she, not because of her physical beauty, or what she does, or the activities with which she participates (or doesn’t participate), but because the One who made her adores her, and always wants what’s best for her. So as she applied foundation on my face, I reassured her of what our family’s true foundation rest upon. As the eye shadow brushed the crevices of my lids, we shared about what colors looks best with mommy’s eye color, but I reassured her that all the make up in the world can’t take the place of a pretty heart desiring to serve others. As the blush went on, I recounted a story of a woman whose whole face was burned in a plane crash, and shared that external looks are fleeting, but internal joy personifies beauty. 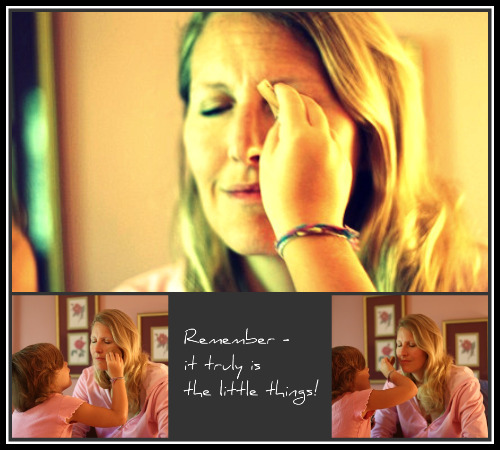 And as she assured me she could put on my mascara perfectly, I told her she better not jab my eye out. (Every moment can’t be perfect. ) And when she did jab my eye, the ministering moment was over, but I know that it wasn’t lost. She won’t be able to tell you what we talked about because to her it was all about making mommy pretty, but I pray that those subtle undertones whispered to her throughout these important years will continue to establish the foundation of real truth. The frugal fashion, the makeup, the exercising, yes, all topics that this mommy regards as fun, and also concepts that reign in aspects of our femininity, but they are not what makes women beautiful. Have you reminded the women in your life of that truth lately? How about yourself? GREAT post! Didn’t even notice you had no makeup on because it was the inner beauty shining through! This is precious. I pray I am also whispering truth into my daughter during these years. Blessings!!! That’s one of the most beautiful things I’ve ever read. What a great mom you are, speaking such great truths to your daughter. It’s so important that all children (& especially little girls) know how much they’re loved for what’s inside and not superficial, fleeting things. How precious is that ? My daughter has been trying to get me to STOP for a minute & treat me to a nice hair do.I’ve always been too busy, or full of excuses because I didn’t want her to be so hard on my delicate permed hair. What an absolutely beautiful post! I have a son, but I always try to find moments to tell him what a wonderful creation he is, and that God has a special plan for him, for which he was created, which no one but he can do. Isn’t it wonderful to have that assurance? Love this!! It is such a beautiful moment between you and your daughter. What a wonderful reminder to stop & smell the roses! 🙂 THANK YOU. Thank you so much for this lovely insight into a mother-daughter relationship. I have 2 young daughters of my own and struggle with ways to overcome the images they get from the world regarding beauty and self confidence. This is a great lesson for your daughter and others as well as a reminder of how awesome He truly is! As I recover from skin cancer being removed from (of all places!) my nose yesterday and seeing my 8 & 6 year old girls so worried, I realized after reading your post that this is a PERFECT opportunity to teach that “man looks at the outward appearance, but God looks at our hearts”. Thank you for grounding me in the truth. Now I will be better equipped to teach this to them! As always, love your posts!